Shamir InTouch™ is the ideal solution for handheld digital device users who have found that their everyday progressive lenses are not providing optimal vision for these tasks. Unlike a standard progressive, Shamir InTouch™ features enhanced visual comfort from 15” – 27”, the distance at which digital devices are primarily held. Patients will also notice a quicker transition of ADD power in the intermediate zone with InTouch™. While typical progressives often have the intermediate zone lower in the lens, Shamir InTouch™ allows the patient’s eye to get to this zone more quickly. Includes Autograph II® with As-worn Technology™ and Autograph II™ with FreeFrame Technology™, a new variable lens design for minimum fitting heights starting from 11mm and up – the shortest corridor ever and provides patients personalized lenses for any frame; Autograph II-Attitude™: which corrects for peripheral distortions and power errors in the line of sight caused by conventional wrap lenses, it provides the patient with a premium wrap progressive with optimal zone widths and clear, distortion-free viewing; Autograph II-Office™: the ideal lens for individuals in their work space, designed to provide them exceptional intermediate and near vision zones for any small environment setting; Autograph II-Single Vision™, which allows single vision patients the chance to experience personalization in a fully aspheric back-surfaced lens; and Autograph II-Single Vision Attitude™ designed for the single vision market, Autograph II-Single Vision Attitude™ provides a customized lens for wrap frames without the distortion found in other progressive wrap lenses. Shamir Optical’s original design software called Eye-Point Technology created a lens surface considering base curve, the prescription, patient measurements and frame details producing wider corridors and less peripheral distortion/blur. In this 3rd generation of the program, Eye-Point Technology III uses improved new tools that allow the fine control of field height and width i.e., manage the change of power through the intermediate at an infinite number of points so that resulting object sizes, seen by the wearer, can be made the same regardless of prescription. 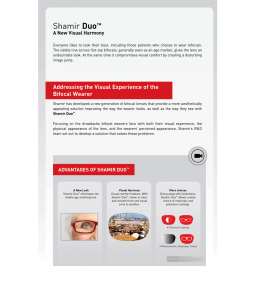 Shamir Duo™ is a new generation of Freeform® bifocal lens that eliminates the visible dividing line associated with traditional bifocals. The smooth surface means no image jump or annoying line along the natural eye path, and allows for a wide choice of materials, treatments and premium coatings. This lens provides patients with a personalized back-surfaced lens at an affordable price. The designs are based on two essential technologies, EyePoint Technology® and Direct Lens Technology®, which together create a back-surface Freeform® lens personalized to each patient’s unique measurements. Because Shamir’s Mensa-like scientists are constantly trying to one-up themselves and bring you the most advanced technology, they set out to create a new Freeform® design that is one step above Element™, but without all of the bells and whistles of Autograph II®; they have done it, with Shamir Spectrum™. No, it’s not a lens infused with caffeine, but it does ease the strain normally associated with prolonged accommodation. If the patient spends the majority of their work day reading or using a computer to complete tasks, the muscles in their eyes are constantly working to focus on these near and mid-range objects, ultimately resulting in visual fatigue. That’s why Shamir Relax™ was created. It’s a single vision fatigue relief lens that relieves strain on the eye muscles and leaves the patient feeling more energized and refreshed at the end of the day. 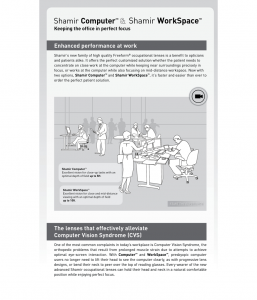 Shamir Computer™ – is more than just a solution for computer users, it serves a wide variety of professions because it provides clear vision for any task performed within 5 feet. Shamir Computer™ is designed to provide patients with a wide field of near viewing with clear vision up to 5 feet, which is a far greater depth of field than that offered by conventional reading lenses. Shamir Computer™ is ideal for patients working at a computer or who are primarily stationary at their desk/workstation throughout the day. Professions that may benefit from Shamir Computer™ include architects, post office clerks, software engineers, data entry clerks, graphic designers, pianists and more. 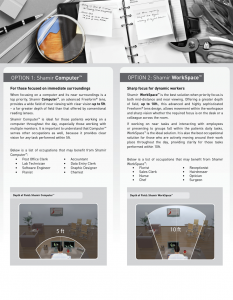 Shamir WorkSpace™ – is the best solution when priority focus is both mid-distance and near viewing. Shamir WorkSpace™ is ideal for both mid-distance and near viewing. Offering a depth of field, up to 10 feet, Shamir WorkSpace™ provides sharp vision whether the required focus is on the desk or a colleague across the room. It is also the best occupational solution for those who are actively moving around their work place throughout the day, providing clarity for tasks performed within 10 feet. Professionals that may benefit from Shamir WorkSpace include florists, sales clerks, nurses, chefs, receptionists, surgeons, hairdressers, opticians and more. Shamir Office™ CR-39 – Shamir Office is more than a computer lens, it is an ideal occupational lens for anyone who needs edge-to-edge, visibly distortion-free, near and intermediate vision. Each design corresponds to a Dynamic Power. The Dynamic Power is the amount of power that is subtracted from the total reading prescription. In other words, it is the gradual reduction of power as the eye moves from the reading zone to the intermediate zone.